What's the Best Type of Fat Reduction Treatment for Me? What's the Best Type of Fat Reduction Treatment for Me? What’s the Best Type of Fat Reduction Treatment for Me? In today’s world, exercise and a healthy diet are not the only methods which can be used to help you lose fat and weight. There are fat reduction treatments of all kinds, mostly coming in the form of invasive treatments and laser treatments. Of course, with so many options available, you might not know which is right for you and your needs. Let’s talk about what fat reduction treatment is right for you. Liposuction is a surgical procedure which involves essentially suctioning fat from the body through a tube called a cannula. Unlike with other fat removal methods, liposuction is capable of removing large volumes of fat at one time. This makes it a terrific method for those who are obese or dramatically overweight. It does this by literally removing fat cells from the body. Liposuction can successfully remove fat from the legs, arms, abdomen, buttocks, and a variety of other body parts. In essence, it can remove fat from the exact areas that you want it removed. The biggest downside of liposuction is that it requires invasive surgery. A surgeon must literally place a tube under your skin so that fat can be suctioned out of your body. This makes it not only a longer lasting treatment but a more dangerous one as well. Compared to other fat removal treatments, liposuction is almost always more expensive. Again, liposuction is an invasive surgery. As with all invasive surgeries, it results in a substantial amount of recovery time. Typically, it takes around 4 weeks for the swelling after surgery to cease. Cool sculpting is a form of fat reduction treatment which involves freezing and ultimately eliminating fat cells permanently. Unlike liposuction, cool sculpting is entirely non-invasive. When the procedure is performed, a device is run over the skin which essentially freezes fat cells. After the fat cells have frozen, they will die, and then flush out of the body. Like liposuction, cool sculpting does accommodate spot fat removal. It can target a specific part of the body, such as the legs, arms, or otherwise, and remove fat from that one particular part of the body. Because it’s non-invasive, cool sculpting requires absolutely no downtime. At the same time, it will not yield results for typically a couple of weeks. Whereas liposuction can eliminate vast amounts of fat at one time, cool sculpting is really only designed to touch up the body. It can only remove small levels of surface fat, but will not eliminate dozens of pounds. It should be noted that once you engage in cool sculpting removal treatment, there’s no going back. This procedure is designed to entirely eliminate fat cells. 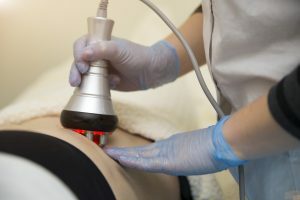 Also known as radiofrequency lipolysis, radiofrequency fat reduction treatment involves heating and, and ultimately eliminating the fat cells. Like cool sculpting, this method of fat reduction is completely non-invasive. Doctors use a device which heats up the fat cells from a distance without even having to touch the patient. After the cells have been heated, they will slowly die off and flush out of the body. As with most fat removal methods, radiofrequency fat reduction treatment is capable of spot removing fat from specific parts of your body. It can remove fat from everywhere from the waist, to the arms, to the legs, and more. Just as with cool sculpting, radiofrequency treatment involves absolutely no recovery time. There are no sedatives or drugs used during the procedure, meaning that you’ll be in a stable state of mind throughout. Radiofrequency treatment, like cool sculpting, is not designed to remove large amounts of fat at one time. It’s a procedure which is more designated for fit people looking to skim off a bit of surface fat. As with liposuction and cool sculpting, radiofrequency treatment is a treatment which will kill the fat cells in your body. Once the procedure has been performed, eliminated fat cells will be flushed out of your body, never to be retrieved. Cell shrinking treatment is a procedure in which lasers are used to shrink, but not eliminate the fat cells. As with radiofrequency treatment and cool sculpting, cell shrinking requires absolutely no invasive surgery. Doctors use lasers to penetrate the skin, release fatty lipids from fat cells, and ultimately shrink the size of the cells. The fatty lipids then enter the lymphatic system, where they’re used as energy. Like any fat removal method worth its salt, cell shrinking treatment is capable of targeting specific parts of the body. This allows you to remove fat from the arms, legs, buttocks, or whatever part of the body you wish without affecting the rest of the body. Cell shrinkage treatment, unlike radiofrequency treatment and cool sculpting, does not entirely eliminate any fat cells. Instead, it removes fatty lipids from those cells, and then uses those lipids as energy throughout the rest of the body. Because it’s completely non-invasive, cell shrinkage treatment requires no recovery time. You’ll be in and out in just a short amount of time with no complications to speak of. Like other non-invasive procedures, cell shrinkage treatment is not capable of removing large amounts of fat at one time. It’s ideally used by those who are looking to spot remove small amounts of fat in specific parts of their bodies. Are you interested in getting cell shrinking fat reduction treatment? If so, Verju is just the treatment for you. Our non-invasive treatment is quick and effective, and requires absolutely no recovery time. You’ll be in and out (with a slimmer waistline) in no time.